Wearable electronic devices are quickly becoming an integral segment of the consumer electronics industry. Wearables come in a variety of different forms and serve a vast array of purposes for their users such as fashion accessories, fitness trackers, gaming devices, and navigation tools. Sales revenue from wearable devices is projected to grow from around 16 billion U.S. Dollars in 2016 to around 73 billion U.S. dollars by 2022. Together with skyrocketing sales revenue numbers, worldwide shipments for wearables are also expected to increase dramatically in the coming years. As of 2016, bluetooth headsets are the largest segment of the wearables industry, followed by fitness bands and smartwatches, but by 2021 smart watches’ position in the market is expected to expand considerably, with projected unit shipments of nearly 81 million. Fitbit, a company which had long been the leader in the wearables industry in terms of unit shipments, has lost its top position as companies like Apple and Xiaomi enter the market. With the release of the Apple Watch in April of 2015, smartwatch sales in the United States jumped from just 2.36 million in 2014, to 10.6 million by then end of 2015. 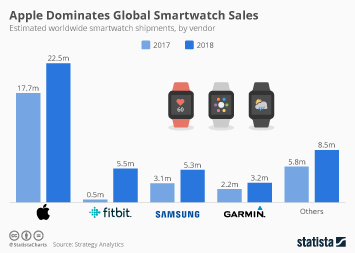 Worldwide smartwatch unit sales doubled from 19 million to 38 million between 2015 and 2016, and the market is expected to continue growing at a similar pace in the coming years, with 2018 projections of around 141 million unit sales. Apple is without doubt the brightest star in the soaring smartwatch industry, shipping more Apple Watches than the entire Swiss watch industry in the fourth quarter of 2017. Although Google hasn’t entered the smartwatch market with a physical product of its own, it has still managed to establish itself as a major brand within the industry thanks to the success of its mobile operating systems, Wear OS and Android. By 2022, Wear OS and Android are expected to be installed in 37 million smartwatches worldwide, while another 34.5 million smartwatches are expected to run Apple's watchOS. As of 2018, 43 percent of United States based respondents stated that they were either very likely or somewhat likely to purchase a wearable such as a smartwatch. Apple and Samsung are the most known and most trusted brands in the industry within the United States, with 56 percent of respondents stating that they would purchase an Apple Watch and 43 percent stating that they would purchase a Samsung Gear. Consumers seem to find fitness to be the most important feature of smart watches followed by communication, health, and maps. Over 50 percent of United States based smartwatch users check their notifications/texts on their smartwatches on a daily basis indicating that compatibility and connectivity are aspects of the smartwatch industry that are highly important to users.